Click to check them out! 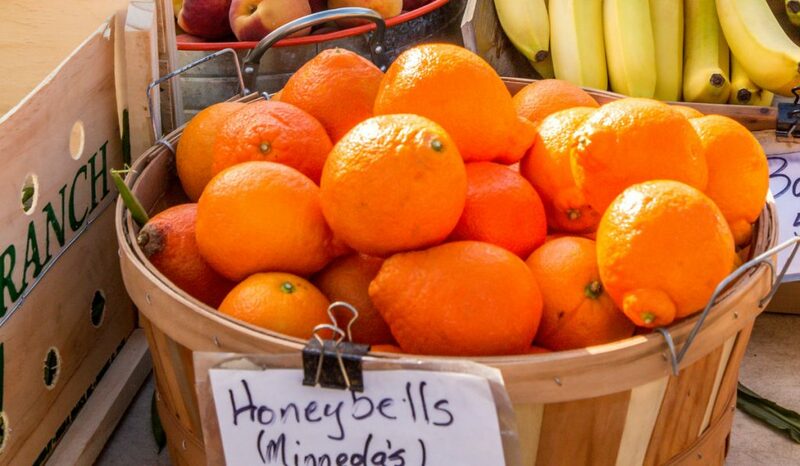 On any given Saturday morning in the parking lot of Venice’s City Hall, throngs of shoppers stroll through the many booths in the Venice Farmers Market, sampling local delicacies and taking in the artwork. A recent visit saw many happy folks dancing to a vibrant steel drum calypso band as the delicious scents of fresh-baked French bread, Spanish paella and South American empanadas wafted through the crisp morning air. A variety of other ready-to-eat foods are available at the more than 50 stands featuring vibrantly colored baskets of organic and farm-to-table fresh produce from regional farms, as well as plenty of handmade arts and crafts. The Venice Farmers Market’s success right now is due in large part to a number of changes that have occurred over the past few years. 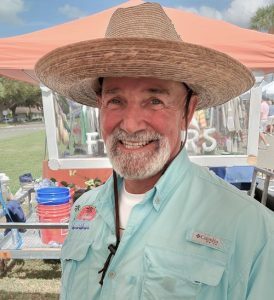 Following the retirement of the previous market manager, in June 2017 the City of Venice awarded the market’s contract to the nonprofit Friends of Sarasota County Parks with Lee Perron as market manager. Lee and his team of four—including Market Operations Manager Tom Stone, EBT/SNAP Manager Amy Stone and Operational Team Member Bob Deal—already had plenty of experience, having founded the Englewood Farmers Market (Thursdays, 9 a.m.) in 2011. Lee’s team is brimming with confidence, spirit and energy and has a sincere desire to bring the freshest local produce possible to Venice shoppers. The group tapped into their many contacts in the local farming and craft foods communities to bring in new growers and have increased the number of vendors to 51. Along with the expansion of the fresh produce and food offerings at the market has been an increasing awareness of local residents of the health and environmental benefits of eating locally grown food. That has resulted in such an increased demand for fresh fruit and vegetables at the market that longtime vendors say the crowds now come immediately when the gates open at 8 a.m., and many growers sell out all their fresh produce quickly. The move to City Hall’s parking lot because of the ongoing roadwork in downtown Venice has allowed the market to spread out, offering much more room for shoppers. But this relocation, which happened this past summer, also came with some challenges. Lee says that since the addition of the new vendors and the market’s relocation, attendance has continued to grow and is now up 35 percent from where it was two years ago. He and his team take head counts in the market every 30 minutes to track attendance. The market is now attracting more than 4,000 people every Saturday. 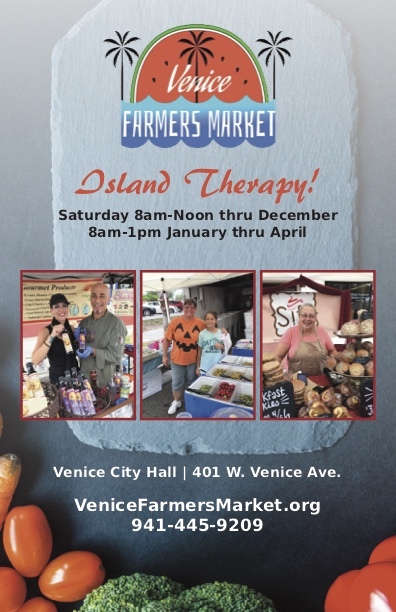 Some of those shoppers take part in the EBT and SNAP food assistance programs, and the Venice Farmers Market matches any funds spent by those participants up to $40. The marker is a nonprofit organization, and the market managers in the past year have donated more than $17,000 back to the community, including gifts to the Salvation Army Food Bank, Good Samaritan Pharmacy (featured in the Good Times section of this issue), Our Mother’s House residential program, as well as local parks. Lee regularly makes meals for himself out of ingredients sourced strictly from the farmers market and suggests that anyone can give that a try. Editor’s Note: We spoke with Lee Perron with the Venice Farmer’s Market (VFM) to learn more about the operation and its community impact. The VFM is held 8am to 1pm every Saturday through April, and 8am to noon May through December. Visit TheVeniceFarmersMarket.org. Lee, what’s the brief history of the VFM and how did you get involved? The VFM has been in operation in downtown Venice on the island for over 20 years. Maggie’s Seafood was one of the first charter members and they still offer Florida wild-caught seafood to this day. How has the Venice City Hall worked as the location? The public response has been very positive. Staff and vendors appreciate the location with its wider pedestrian walkways, beautiful shade trees and picnic tables. The City has been a great partner. How many vendors participate and what’s the economic impact? We now have 51 vendors. The 19 newer vendors have been local farmers, rock star bakers, and artisan food purveyors. Adding more food options has enhanced the VFM. The UF Economic Impact Study concluded vendors created $2.6M in revenue with a total impact of $5.3M on the downtown area. What’s the process for selecting vendors? We are at capacity with a long waiting list, but completing an application is the first step. We are always looking for diverse and high-quality products that address the needs of our customers. And of course we value attracting top notch people that support their product. Professionalism, experience and a strong customer service background enhance the market experience. How does the market benefit local nonprofit groups? Every week we have a non-profit guest to help build awareness of their mission, fundraising opportunities and volunteer needs. We contributed $17,000 in 2018 to local nonprofits serving the Venice community. We also offer the Supplemental Nutrition Assistance Program (SNAP) benefits, and we double participant’s money when they shop so they can purchase twice as much nutritious food. Lee, what’s your professional background? I worked 27 years in the cable television and Internet industry and that includes serving as senior vice-president for Adelphia Communications. What do you enjoy most about your role with the Venice market and the Thursday market in Englewood? I appreciate our focus on nutritional health, education, sustainability, and community goodwill. I also value being part of an organization that supports local nonprofits. How are the two markets similar and dissimilar? Both are nonprofits with the same mission and a focus on providing good food from local sources. Each community has its own personality and preferences, so many of our vendors reflect those nuances. VENICE ROCKS THE DOWNTOWN VENICE FARMERS MARKET! Please plan to join us this Saturday, August 5, 2017 from 9 to 11 AM at the Venice Farmers Market in the 200 Block of Tampa Avenue W., for a FREE ROCK PAINTING event for children of all ages hosted by Venice Rocks. Venice Rocks is the brainchild of Garden Elementary art teacher Joanna Davis and is part of the rock painting craze going viral across the internet. Free rocks and art supplies will be provided by White Cement Specialties, Bespoke Cabinet Design and Mermaids Design Studio. The rock painting theme will be Florida fresh fruits and vegetables! Once painted the rocks can be “secretly” placed around Centennial Park for a surprise discovery! So load up the kids and head on down to the Venice Rocks family fun event this Saturday at the Venice Farmers Market. For more information contact Lee Perron via e-mail: info@thevenicefarmersmarket.org or by phone (941) 445-9202. Linda Wilson retired this month. VENICE — The Friends of Sarasota County Parks will officially take over operation of the Venice Farmers Market when it opens at 8 a.m. today along the 200 block of Tampa Avenue. Patrons will not see any changes as all the usual vendors will be there. And they may even recognize the new manager, Lee Perron, as a familiar face because he regularly pinch-hit for former manager Linda Wilson while she was on vacation. “First off, we’re thrilled to be working with the community and the city of Venice,” said Perron, who also manages the Englewood Farmers Market, which is open in season on Thursdays. The Friends of Sarasota County Parks operate the Englewood market and a Wednesday market hosted at Phillippi Estate Park in Sarasota County. As a practice, the nonprofit group donates proceeds above operating costs to other area nonprofits. At Phillippi Estate Park, that typically means supporting the maintenance of a historic home at the park. In Englewood, proceeds go to local parks, food banks, the Englewood Care Clinic, Meals of Wheels and Englewood Elementary School. “We will be working with the Venice community to get an idea of where will be the best places to invest, that adds the most value,” Perron said. Wilson, who operated the Venice market for six years, retired in June to travel with her husband, David. Under her auspices, the market grew from 14 vendors to 45 in season, and at least 38 in the off-season. The city opened a search for Wilson’s successor, though City Manager Ed Lavallee said the Friends of Sarasota County Parks was an easy choice, partly because of how well Perron and Wilson had worked together in the past. Perron and Wilson brought the Supplemental Nutrition Assistance Program to Venice and Englewood in 2014. The program allows people to use their Electronics Benefits Transfer cards to purchase produce, receiving up to $20 in additional buying power to help combat food insecurity. And, of course, he already filled in for Wilson when she was absent. “If anyone has a working knowledge about how this operates, it’s him,” Lavalle said. Lavalle characterized the handoff between Wilson and Perron as a smooth one. “She has done a great job of keeping her vendors informed, indicating to them how they have to maintain their insurance, identified the new market managers by name, so their insurance and liability coverage is up to speed, so I think they’ve done a remarkable job in a relatively short period of time providing for the change.” Lavalle said. Even as Perron gets acclimated to the market on Tampa Avenue, he will have to search for a temporary site by April 2018, when the city is scheduled to rebuild Tampa, Venice and Miami avenues as part of the $18 million road bond projects. The work is scheduled to be complete in November 2018. But even without the road project, there have been thoughts of moving the market off Tampa Avenue for a variety of reasons, Lavallee noted. Perron said there’s plenty of time to work out a temporary site during the road construction as well as determine whether its future is back on Tampa Avenue or another city location. Perron said the market won’t see any major changes. Unlike Englewood — where all vendors are agricultural in nature — Venice has a mix of food and arts and crafts vendors. Both have extensive educational and children’s programs. “That’s a really good mix for Venice,” Perron said. “Different communities really represent different needs; you really can’t cookie-cutter vendors from one community to another in a thoughtful way. Interested in becoming a vendor at The Venice Farmers Market? Get started by downloading a vendor application!